Gold chains are eternally popular pieces of jewelry. For both men and women, worn alone or with a beautiful pendant, this versatile jewelry staple adds to virtually any ensemble. Rope Chain: As the name implies, a rope chain resembles the style of a rope. This style is often worn with pendants. Herringbone: Often worn alone, this intricately woven chain lies flat against the wearer's neckline and provides a rich, lustrous appeal. Fox Chain: A fox chain consists of two gold strands bound together with a braided look. Box Chain: A chain consisting of small, box shaped links. This type of chain is another popular type to wear with pendants. Bar and Bead Chain: This type of chain utilizes a repeating pattern of rounded rectangular or bar shaped links and gold bead links. This type of chain is often found in contrasting golds, such as white and yellow gold. Rolo Chain: Typically consisting of broad, circular links, these chains offer a simplistic, yet sturdy and stunning look. Hollow rolos are similar, with the variation of hollow spherical links. Singapore Chains: These delicate chains are ideal for women. The appearance is a slightly twisted, delicate rope and is ideal for charms. Cable Chains: Oval links are alternately linked together for a classic chain appearance. Curb Chains: A curb chain is made from a series of circular, flattened links. These are ideal for men and in larger sizes are often seen in hip hop jewelry. Marine Chains: These chains are designed from oval links with a post or bar centered vertically in between each link. The result is a more intricate appearance than standard oval link chains. Although the traditional classic is yellow gold, gold chains are also available in white, black, rose, and multi-colored gold. Black Hills gold uses rose, yellow, and green tinted gold in its grape and grape-leaf designs. Colored gold is created by mixing other metal alloys with the gold to create the desired color. The quality of gold chains varies depending on the amount, or number of karats of gold, a chain contains. Pure gold, for example, is 24 karats, and a chain containing fifty percent gold would be 12 karats. Chains are almost never designed with pure gold; however, as the gold alone is too soft for wear. The addition of other metal alloys strengthens the jewelry so it can be easily worn without constant fear of damage. Some gold chains are actually gold-plated. This means that the chain is composed of copper, silver, or some other metal, but has had an application of a thin layer of gold deposited over it. The result is a gold-like appearance. 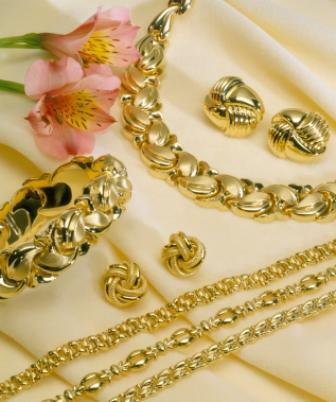 Unlike chains containing actual gold, gold-plated chains will eventually show signs of tarnish as the plating begins to wear off. The cost, however, is typically much lower than gold necklaces or chains, so the tradeoff is often worthwhile for budget conscious jewelry lovers, or those interested in the latest fashion jewelry trends. Chains are typically sold in a variety of lengths dependant upon the wearer's size and drape preference. Lengths are generally available in increments from sixteen inches to over twenty-four inches. The costs for gold chains depend upon the quality, length, and style. Long or intricate chain styles with high concentrations of gold can cost thousands of dollars, while a shorter, simple rope-style 14K can be easily purchased for less than one hundred dollars. Durable, beautiful, and versatile, a gold chain is a purchase you'll never regret.